Back in 1969, the Rolling Stones fired founding member Brian Jones and hired guitarist Mick Taylor. In late 1974, Taylor did the unthinkable: he quit “the world’s greatest rock band”. This led to the third Stones guitarist in six years, as the band “borrowed” Ron Wood from the Faces to take Taylor’s spot. Apparently that choice stuck, as Wood remains a Stone almost 40 years later. 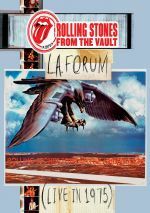 With a new DVD called LA Forum Live in 1975, we get to witness Wood’s debut tour with the Stones. The program documents the band’s July 15, 1975 concert at the Forum, the fourth of their five shows there that year, and it offers a broad array of songs from their career to date. In any case, we get four songs from the most recent “new” release, 1974’s It’s Only Rock ‘n’ Roll: the title song, “If You Can’t Rock Me”, “Fingerprint File” and a cover of the Temptations’ “Ain’t Too Proud to Beg”. Off 1973’s Goat’s Head Soup, we find “Star Star”, “Angie” and “Doo Doo Doo Doo (Heartbreaker)”, while 1972’s Exile on Main Street presents “All Down the Line”, “Happy”, “Tumbling Dice” and “Rip This Joint”. Heading to 1971’s Sticky Fingers, we discover “Brown Sugar”, “You Gotta Move” and “Wild Horses”. 1969 presents the single “Honky Tonk Women” as well as three Let It Bleed numbers: “Gimme Shelter”, “You Can’t Always Get What You Want” and “Midnight Rambler”. From 1968, we get the single “Jumpin’ Jack Flash” as well as Beggars Banquet’s “Sympathy for the Devil” and “Street Fighting Man”. The 1965 single “Get Off of My Cloud” also appears, and we get two songs from guest performer/pianist Billy Preston: “That’s Life” and “Outa Space”. Notable in its absence: 1965’s “(I Can’t Get No) Satisfaction”. This wasn’t that unusual for 1975, as the band had apparently skipped their biggest hit during their dates in 1970, 1972 and 1973. From what I’ve read, “Satisfaction” popped up a handful of times in 1978 but didn’t return to a regular place in the band’s setlists until their 1981 tour. I’ve seen the Stones 50-plus times since 1989 and only missed “Satisfaction” once in that span; they omitted it at a special club show I witnessed in 2002. Like I mentioned when I reviewed the 1981 concert linked above, the Stones didn’t really start to veer into “oldies act” territory until 1989 or so. The 1975 tour did stand out due to the lack of truly new material to promote, but it nonetheless presented a band who could continue to legitimately claim to be the biggest in the world and one whose new material inevitably sold well and attracted tons of attention. People didn’t complain or hit the bathroom when they played fresh songs. As one who didn’t see the Stones until 1989, I find the sight of the band in “current hit-maker” mode to be fascinating, and while Forum doesn’t show them at their creative or commercial peak, it does let us see them close to that era. While Wood lacked Taylor’s technical chops, he melded with Keith Richards better, and that gives the band a cohesion they otherwise might lack. Wood simply plays a better foil, though he seems more subdued here than we’d see in later years, which makes sense. As the “new boy”, he likely didn’t want to step out of line. Heck, Jagger barely seems to regard him as a member of the band; when introduced, he calls him as being “from the Faces pop group”! On other recordings from 1975 I’d heard, Jagger seemed overly willing to bark out lyrics. Combined with seemingly relentless shouts of “sugar pie” or “sugar pop” – I could never tell which – I found these other tapes to make the singer borderline insufferable. Happily, this show presents Jagger in good form. Yeah, he still tends to yell more than sing, but he avoids too much excess and does pretty well. This seems like middle of the pack Jagger, but given the annoying vocals I expected, I’m fine with that. The concert shows Jagger in hyper mode – and I mean hyper even by his own frantic standards. That can get a little tiresome at times; I love the man, but occasionally you want to just slap him and tell him to stand still for 20 seconds. Still, those behaviors helped make him a legend, so while he can be over the top, it’s still usually fun to watch him. And we do see a lot of Jagger in this video. Forum lacks a credit for director, so I don’t know who made the shot choices, but the program sticks with Mick the vast majority of the time. To a degree, I don’t mind that. Jagger is arguably the greatest frontman of all-time and he’s the visual focus of the band. But still, it’d be nice to get more acknowledgement that others reside on stage with him. Even during the long instrumental part of “Midnight Rambler”, the camera remains on Mick most of the time, which seems strange. At times like these, though, I sort of feel like I need to turn off my critical side and think how my teenage self would’ve felt if he could’ve seen a product like this. Back in those dark days before the Internet, DVDs and Youtube, programs like this were more rumor than fact, and the notion that I could watch an entire vintage Stones show would've made me poop my pants. 30 years later, no defecation occurred as I viewed Forum, but I did occasionally reconnect to my younger self and feel a little giddy that I owned it. At no point does Forum offer a perfect show or a perfect product, but it lets us seem the Stones in their “classic era”, and I’m pretty darned happy to be able to do so. Rolling Stones: LA Forum Live in 1975 appears in an aspect ratio of approximately 1.33:1; due to those dimensions, the image has NOT been enhanced for 16X9 televisions. Taken from a nearly 40-year-old video source, this wasn’t an attractive presentation, but it looked about as good as I could expect. Sharpness varied. Close-ups looked reasonable but anything beyond that range tended to appear fairly soft and fuzzy. Mostly the picture came across as muddy and without great delineation, especially since true close-ups remained infrequent; much of the show stuck with fairly wide shots. Moiré effects and jagged edges presented no concerns, but artifacts were a concern, as many objects featured a distinct glow around them. Much of this seemed to result from the lighting, but it appeared a little severe to discount totally based on that factor; moderate haloes could be seen. Source flaws didn’t seem apparent, though some video noise showed up at times. Colors tended toward a heavy feel, as they were usually overwhelming; the hues would be dense and thick, without much accuracy. Black levels appeared fairly flat and lackluster, while shadow detail was too opaque; low-light situations seemed murky and impenetrable. When I saw Forum on the release schedule, I felt disappointed Eagle Rock didn’t offer a Blu-ray version like they did for the Hampton 1981 concert. That came from a videotape source as well, so why not put out Forum on BD? Now that I’ve seen it, the answer seems to fall into “putting lipstick on a pig” territory. As I noted, this wasn’t an attractive image at all, but that said, I can’t say I’m disappointed. Even with a superior video source and Blu-ray resolution, the Hampton show didn’t look especially good, and I don’t think Blu-ray would’ve added anything to the visuals. Audio offered a different equation, though, as I would’ve liked lossless audio from a Blu-ray. Not that I had significant problems with the DVD’s sound, as the music worked fine via the disc’s DTS 5.1 and Dolby Digital 5.1 mixes. Both seemed similar; I thought the DTS track might’ve been a little warmer, but it also was louder, so the end result was essentially a wash.
As one expects from a concert presentation, the soundfields remained focused on the front, where they showed strong stereo imaging. Mick’s vocals appeared firmly set in the middle. The instruments were accurately located and they demonstrated nice breadth and delineation. I could distinguish the various instruments with ease, as they were placed in a natural and clear manner. They also blended together smoothly to create a forward soundstage that consistently created a real and involving setting. As for the surrounds, they seemed to be essentially non-existence. Whether DTS or Dolby, I detected virtually no audio from the back speakers. Perhaps they added gentle reinforcement and ambiance, but if so, they did so in such a gentle manner that these elements remained undetectable. Audio quality was solid. Mick’s vocals worked fine, as they replicated the desired impressions well. The rest of the track also showed good clarity and a dynamic tone. The instruments remained crisp and vivid during the concert. Bass seemed warm and full. I’d still have preferred lossless Blu-ray audio, but the tracks here satisfied. The package includes a 16-page booklet. It provides an essay from Richard Havers as well as photos and tour artifacts. Despite a few mistakes in Havers’ notes, this becomes a nice complement to the set. While not the band’s peak, LA Forum Live in 1975 shows the Rolling Stones in fine form. It gives us a full concert with an interesting setlist and mostly good performances. The DVD presents pretty good audio along with flawed visuals and minor supplements. Despite the unavoidable issues with picture, I’m very happy to own this DVD and think Stones fans will love it.